A close look at a BYU day reveals a campus that is both familiar and surprising. Feeling for once like a true investigative journalist, I was on a self-guided campus tour, weaving through busy thoroughfares and poking my head into less-populated campus haunts. For our “24 Hours at BYU” photo shoot, I was hunting for photogenic evidence of the peculiar quirks, charm, and character that define BYU in the early 21st century. Striding self-importantly about campus, walkie-talkie in hand, I radioed every promising photo-op I spied to the editors stationed at our command center in the Wilk, from which we were coordinating 30 photographers’ efforts that day. Along with depleting our ranks of available photographers, my incessant pleas for someone to come shoot this or that instance of iconic serendipity had become a command-center joke. 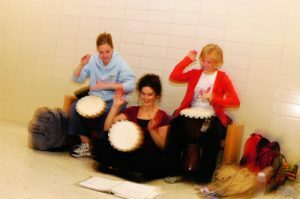 Dance students (from left) Jerica Obert (’06), Shawna Haley Perez (’06), and Michelle H. Nielsen (’05) practice their drumming for a dance-accompaniment class. Photo by Annie Jones. But I couldn’t restrain myself. At every step I saw examples of classic BYU behavior: There were students strumming guitars, sending text messages, snoozing on almost every level surface, sizing up prospects, and, of course, studying. Workers were selling books, planting pansies, transforming devotional décor into basketball floor, and pouring concrete. And in classroom after classroom, lab after lab, and office after office, faculty and students were gathered in groups large and small, professing, debating, and applying disciplines that collectively cover everything in heaven above and on earth below. All this was vintage BYU, and I wanted to make sure our cameras captured it for our campus portrait. But then in the RB corridors my ears met the echo of beats far too rhythmic to be from basketballs, and I found something I hadn’t expected at all. Students playing bongos in the RB? Who would have thought it? We had to get a photographer to shoot this. Although our photographers captured ample imagery to confirm many of our preconceived notions of this peculiar place, bongo-like surprises seemed to lurk around every corner. There was the remote-controlled blimp soaring over the munching minions in the Wilkinson Center Terrace at lunchtime. There was the multitasking student who read from a text while riding with no hands on his bike across campus. There was the technology professor dressed as Aristotle to explain classical theories. There were two men cutting meat for campus orders in a remote campus basement. Just when you think you’ve got these 600 acres called BYU figured out, you happen upon bongos or a blimp or an ancient Greek or a butcher, and you have to repaint your mental picture all over again. Though some aspects of BYU‘s culture and character seem fixed from generation to generation, our photo shoot revealed a BYU that is surprisingly surprising. One discovery was just how busy this place is. By the day’s end, we were convinced that even with our 30 photographers taking some 12,000 images—enough to induce trigger-finger tendonitis—we’d only scratched the surface of all that goes on here during an ordinary day. But even squeezing the best of our photos into 62 pages was a challenge. In the end we could use less than 2 percent. We also realized that some parts of the BYU experience don’t translate well into photos, or words for that matter. Things like feeling the Spirit or falling in love are more readily impressed on hearts and minds than on paper. What we ended up with were a couple hundred images pieced together into a sort of BYU mosaic. We couldn’t show everything, but we hope the rough portrait reflects what we found—a BYU that is at once familiar and surprising—the home of the bell tower and the botany pond, of butchers and bongos. EPILOGUE. There were no bongos in the RB. Further investigating the bongo incident, I called one of the RB drummers, Jerica Obert (’06) of Riverton, Utah, to account for her whereabouts and activities on the morning of Sept. 22, 2004. She flatly denied pounding on any bongos, despite apparent photographic evidence to the contrary. Exposing my ignorance and seriously compromising my lead for this essay, she politely explained that those drums were in fact African djembe drums, not Cuban bongos. So I’ve come full circle. There weren’t bongos in the RB. Just when I thought I had this place figured out . . .